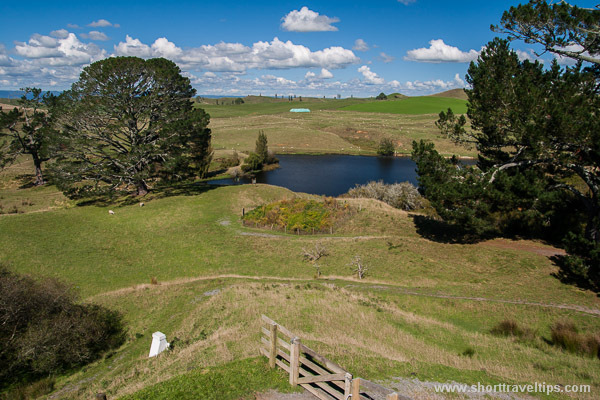 Only seven weeks left until premier and I think it is time to visit one of best preserved site where “The Lord of the Rings” and “Hobbit” trilogies were shot. I am talking about Hobbiton. It is located in the middle of North Island in New Zealand and was “discovered” by Peter Jackson and New Line Cinema during aerial search for suitable “The Lord of the Rings” sites in 1998. The site closely resembled Middle-earth described by Tolkien. The large established pine tree later to become known as the ‘party tree’, was already perfectly placed in front of the lake. The surrounding rolling farmland was untouched by 20th century. There was no roads, power lines or any buildings on the site. Thought the landscape was almost perfect it still required a lot of work to do. It took almost nine months to finish all preparation. Firstly New Zealand Army was contracted to build 1.5km (1 mile) road into the site. 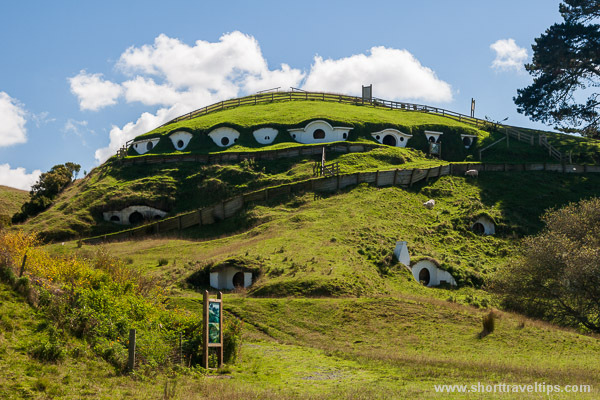 Then thirty-seven underground hobbit holes (smials) were created, mill and double arch bridge were built out of scaffolding, ply and polystyrene, glued and painted. Barberry hedges and trees were brought in and gardens were nurtured throughout winter. 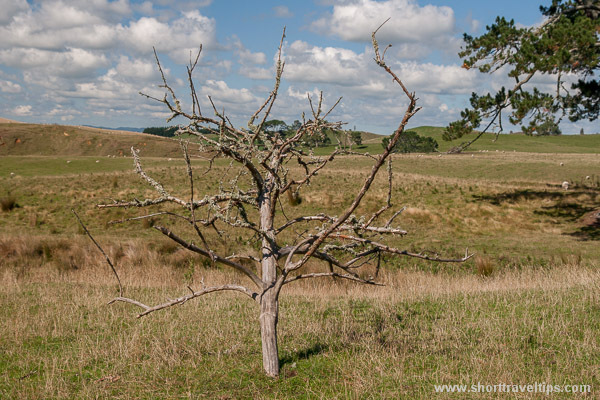 Oak tree overlooking Bag End was cut down and brought in from near Matamata. Each branch was numbered and chopped, then transported and bolted together on top of Bag End (26 tonne). Due to the intense heat of studio lights real trees on a set had a maximum “leaf life” of five days, millions of artificial (made from silk) leaves were imported from Taiwan and individually wired onto the dead trees to help foliate the woods of Middle-earth. Site construction started in March 1999 and filming commenced in December of the same year and continued for three months. At its peak 400 people were on site including Peter Jackson, Sir Ian McKellen(Gandalf), Elijah Wood(Frodo), Ian Holm(Bilbo Baggins), Sean Astin(Sam) and others.. I don’t know how, but they managed throughout construction and filming all activity on the site to keep under strict security. It was even declared as no flight zone. After the filming of “The Lords of the rings” all decorations supposed to be cleared, but because of heavy rain no machinery could go on wet ground for the couple of weeks. Later owners of the land made agreement with movie studio to leave everything as is. Of course a lot of decorations didn’t survive as it was made from polystyrene, but natural party tree is still there. Most of smials are also in the place. Just don’t expect to enter inside, as only Bag End was made as real home. 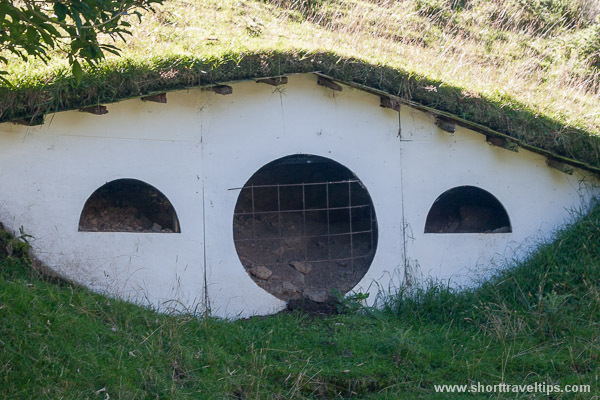 Other smials (hobbit-holes) were only imitations. Last year the site was closed for public because it was used for the filming of “The Hobbit” trilogy. 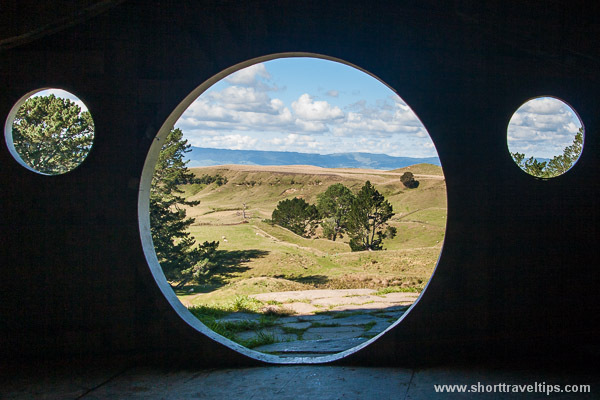 But now it is open and it probably looks even better because Sir Peter Jackson’s Wingnut Films Productions Limited and Rings Scenic Tours Limited created join venture called Shire Tours. My photos were taken 4 years ago and I expect they left more decorations this time. Picture below is taken from Great Sights New Zealand. The only bad thing with this new venture is the new price. It was $50 entry fee couple years ago, and now it is $75. But if you are fan or LOTR or The Hobbit this site must be on your to do list. 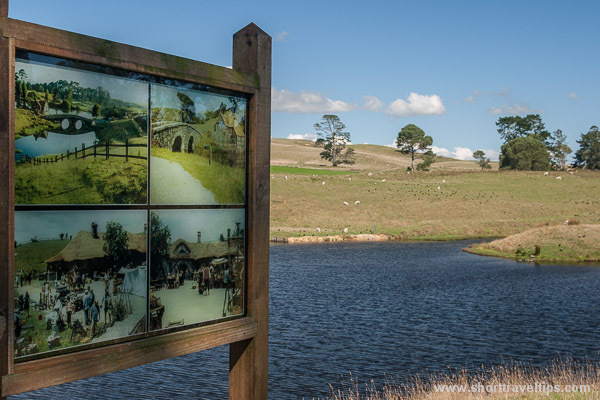 Make sure you have “The Lord Of The Rings” trilogy DVDs ready at home, as you definitely will want to watch it again after your visit to Hobbiton. I will definitely watch Hobbit.. This place is feature several times and in ANTM.. I don’t watch ANTM, but should check that episode.